Industry innovation—and the importance of ensuring that it gets funded—took center stage at last week’s Sports & Fitness Industry Association Industry Leaders Summit in Denver, CO, where the organization’s third annual Start-Up Challenge featured entrepreneurs vying for a $15,000 grand prize. On the first morning of the Summit (read more about the event by clicking here), the Challenge’s six finalists showcased their startup companies to a panel of industry veterans and venture capitalists, who asked about everything from the startups’ go-to-market plan to their funding progress to their product sourcing. New technologies on display included a redesigned hockey stick, a pay-as-you-go gym membership app, a brain injury measuring system, an interactive technological game for youth, a mobile fitness board and a patch that monitors dehydration. The event was designed to “highlight small business innovations to industry leaders,” John Peters, SFIA’s vice president, business development, told SGB this week. High demand for inclusion in the 2018 Start-Up Challenge also sparked SFIA to increase the finalist pool to six companies from five. The winner of this year’s Start-Up Challenge was Nix Biosensors, the creator of high-tech sensors that are capable of measuring and managing a person’s hydration status via sweat to optimize safety and physical and cognitive performance. 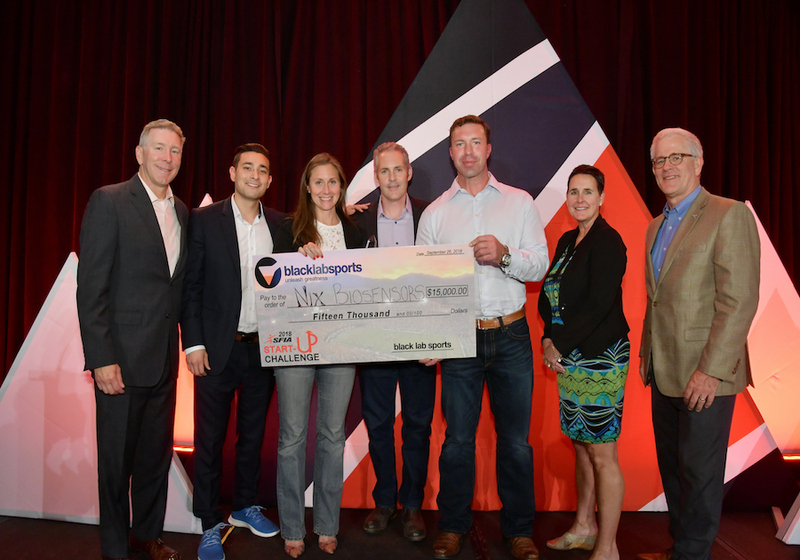 Boston, MA-based Nix won $15,000, provided by Black Lab Sports and presented on Wednesday night (see above for a photo of the check ceremony), and an all-expense-paid trip to spend the day with the Under Armour Innovation Team. The company’s founder and CEO, Meridith Unger, made a compelling case for Nix before the panel, which was interested in the company’s product specifics, applications, current and potential market, marketing strategy, intellectual property rights and funding goals. 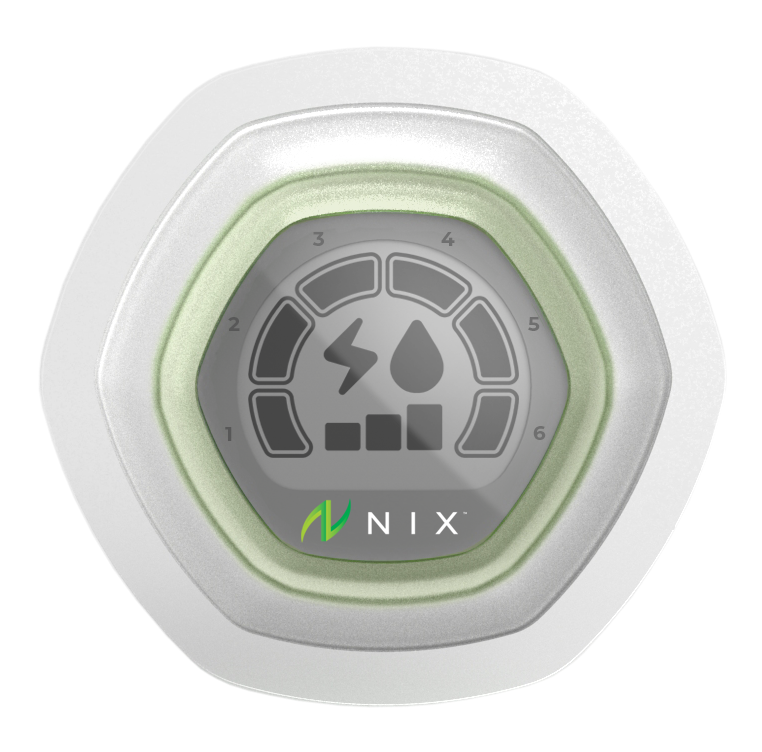 The Nix sensor (a rendering is pictured at right) isn’t for sale right now but is in development. In addition to seeking funding, the company is focused on building a market for the product by targeting race partnerships (the sensor would be sold to race participants when they register online), specialty retailers and sports influencers. Unger, whose background includes developing business strategies for health startups, said the Start-Up Challenge not only will help the company move closer toward its goals but is also validation of the work she and her team have invested. There’s also a chance that venture capitalists will come forward with funding, as they have for past winners (and runners up). SGB spoke with Unger this week about the honor of winning the Start-Up Challenge and what’s next for Nix Biosensors following this achievement. What prompted Nix to enter the SFIA Start-Up Challenge? Certainly, a generous cash prize is always a strong incentive to enter a challenge like the SFIA Start-Up Challenge. But more than that, I was excited for a potential opportunity to take the stage in front of an audience that I knew the Nix story would resonate with–one that goes well beyond “sports” and really embraces “fitness” which is core to what Nix’s mission. What were your reactions to: A) being selected as a finalist and B) winning? We are really fortunate that when we tell our story, people just get it. Hydration is fundamental across all segments of sports and fitness, and every athlete has gotten their hydration wrong at some point and suffered the consequences. We’ve been able to put together a strong team, a business model that makes sense for our segments and get some good early traction. It’s thrilling when we get the affirmation of winning something like the SFIA Start-Up Challenge in front of a panel of judges who are leaders in the industry. What does this award mean for the company beyond the cash? I.e., does it provide further validation of business idea and all the time, money and energy you’ve poured into it? An award with SFIA’s name on it brings tremendous credibility and validation to Nix and our story. In the few days since we won, I’ve already had several industry contacts reach out to me with congratulations after having seen the announcement, so the benefits of winning the SFIA Start-Up Challenge go way beyond the cash—although that always helps, too. What feedback did you get from the panel? I always interpret questions as a form of feedback, so even just hearing which parts of our business model or execution plan get probed is useful feedback on the pitch, product and plan. What do you hope to get out of your day with Under Armour’s innovation team? Under Armour is a tremendous force in sports and sports tech, particularly with multiple hardware and software platforms that they’re leveraging to further their brand and value creation with their customer. I look forward to getting additional feedback from the UA team on our direction and product potential. Where does Nix Biosensors go from here? It’s a busy time for us, as we are in the process of closing our seed round, so I’m charging hard down that path and look forward to announcing our win of the SFIA Start-Up Challenge to prospective investors as further fodder for our traction and validation.